Want to play an mp3, m4a, or audio file on a Mac, but you don’t want to add that MP3 or audio file to your iTunes Library? There are a few different ways to accomplish this task; one approach allows you to play an audio file in an iTunes playlist without copying it to the iTunes music library, and that works in iTunes for both Mac and Windows, and two other approaches will allow you to play audio files and mp3s on a Mac without using iTunes at all, instead utilizing either Quick Time or Quick Look, thereby never adding those audio files into iTunes or any playlist. These tricks can be useful for one-off audio files that you just want to listen to but don’t want to permanently store on the computer. Maybe it’s a shared voice memo from an iPhone, maybe it’s a podcast you don’t want to store or listen to again, perhaps it’s a shared voicemail from an iPhone, or maybe it’s an audio file you need to hear but don’t want to save. There are many practical applications for this, as surely you can imagine. In the examples below, we’ll be listening to a podcast mp3 file without adding the file itself to iTunes, the first method uses iTunes, the second option uses QuickTime, and the third option uses Quick Look. In the example screenshot below, four podcast files were added to iTunes in the general playlist, but without adding those podcast files to the audio library of iTunes itself. This approach will add the audio file to the iTunes Library, but not copy the audio files to the iTunes media library on the computer, essentially using an alias or soft link from iTunes to the files original location on the computer. You can later remove the audio file from iTunes playlist at any time if desired. You may find it useful to know you can also use a similar approach to copy music and audio files directly to an iPhone, iPad, or iPod without adding the audio to iTunes as well, as discussed here. But what if you want to play an audio file without even adding it to the iTunes playlist or library? What if you just want to listen to an audio file without iTunes at all, perhaps for hearing a podcast once, listening to an iPhone recorded voice memo, or hearing a shared audio file just once? The next options can be useful for that scenario. QuickTime also offers a simple way to play nearly any audio file on a Mac without having to use iTunes at all, thereby preventing the audio file from being added to either an iTunes Library or iTunes playlist. This is great for a one-off listening, and if you want to avoid iTunes in general for whatever reason. An advantage to using Quick Time is that you can background the app while the audio file is playing, and continue to perform other functions on the Mac, similar to how iTunes plays in the background. The downside to Quick Look is that it Quick Look stops playing audio files when the Quick Look window is no longer in focus, or if another file is selected in the Finder. Of course there are other apps out there that can play audio files and media files on the Mac, without requiring iTunes, but for our purposes here we’re sticking to the default apps bundled in Mac OS, that way you won’t need to download any additional apps or utilities. Another option not directly mentioned here is the tool afplay, afplay allows you to play mp3 files at the command line, or play nearly any other audio files at the command line of the Mac. The command line approach is certainly valid and works great, but it’s a bit more advanced. Do you know of any other tricks that allow you to play an audio file, mp3, m4a, etc, without adding the original file to iTunes? Share them with us in the comments below! afplay in the command line can do it! 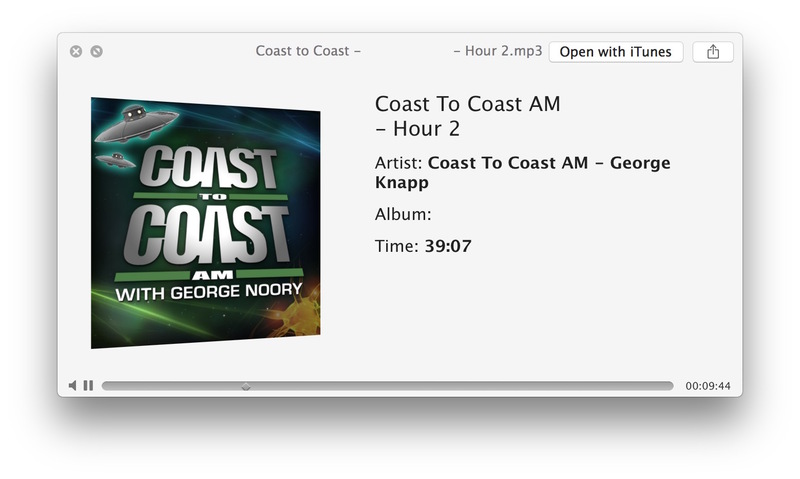 Wow, havent heard of coast to coast since art bell left!! 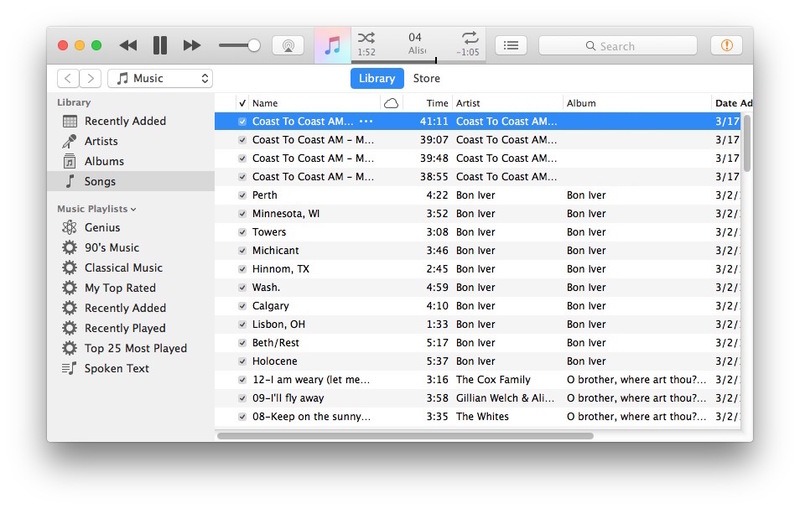 If you view the songs in column mode on the Mac, you can play the songs from there–one at a time. Even if you are doing something else. As long as you keep the finder window open. What’s the issue with just using apple-native apps? Some kind of artificial constraint? Downloading apps is easy, and that’s probably how the mp3 got there in the first place. Just use one of the several freebie player apps like cog, decibel, or even VLC. They even let you build playlists and such. Flac ok works in quicklook press space key, but iTunes not play. Or just hit the space bar. Why make it complicated? Steve it’s the OSXDaily way!!! LOL!!! Simplest way is to command(right click) open with Quicktime IMO. This has been a default command for OSX for years. Right-click/control-click on the audio file.”Open With” reveals the list of Default and alternative programs that can play it. No one knows how to answer my question? The link between your iTunes Library files and iTunes application has been broken for some reason. It’s possible that you do not have the same hard drive connected, or you changed a folder name, or changed the name of the hard drive, and it’s possible the files were deleted too. The simplest solution is to locate your music files on the disk, and then select that directory as your iTunes Music Library folder through iTunes Preferences. You may need to search for audio files via the Finder to locate them if you can’t find them otherwise.